I like to celebrate winter in style: with bursts of colour! In general, I avoid black in favour of colours, and being called “the bright girl” suits me fine. 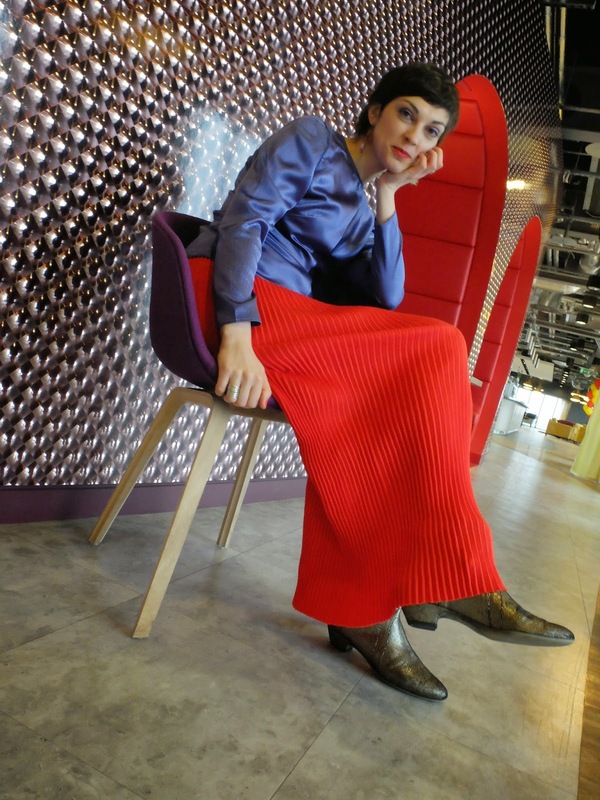 For this reason I sewed this combo: a purple silk blouse and a red knit skirt. When working with Burda patterns, as a rule, I use a size 36 for tops. In the case of this blouse, I did not want it to be very fitted so I traced the pattern in a size 38 to creating some sort of breezy effect. I hope I achieved that! Then, I went for my favourite French seam to finish all the raw edges and bound slit, following this tutorial by Marina. Do you see the seam at the centre of the front piece? Well, that happened because I cut the pattern pieces in the wrong order (the back and the sleeves first, then the front) and the last piece of fabric was not wide enough to fit the entire front piece. Therefore I had no other choice than to cut two pieces instead of one. Damn it! Nonetheless, it looks like a blouse with a “designer” modification. The fabric for the skirt was purchased during one of my trips to Paris where Julie took me fabric shopping to some fabric re-seller, called Will. He sells fabric remnants from different factories as well as designers. Then, he sells them on local markets in different cities around Paris. So to buy some great fabrics from Willl, Julie and I went all the way from Paris to a local market in Nogent-sur-Marne, where Will was selling fabric pieces (called “coupon” in French) which are three metres each. According to Will, this fabric was a leftover from an Isabel Marant collection; I took his word for it. It was love at first sight! First of all, I absolutely loved the colour, but also, because I’ve never seen anything similar before: this knit came in a tubular shape! Well, most knit fabric is made as a tube anyway, but I’ve never seen shops sell it this way. In order to make the skirt, I cut one length of fabric and overlocked seams, but left the hem’s edge raw. For the waistband, I attached the widest elastic band I could find and covered it with self fabric. After all, I was quite happy about it! Working with silk becomes easier and easier with each project as well as tackling new sewing techniques. 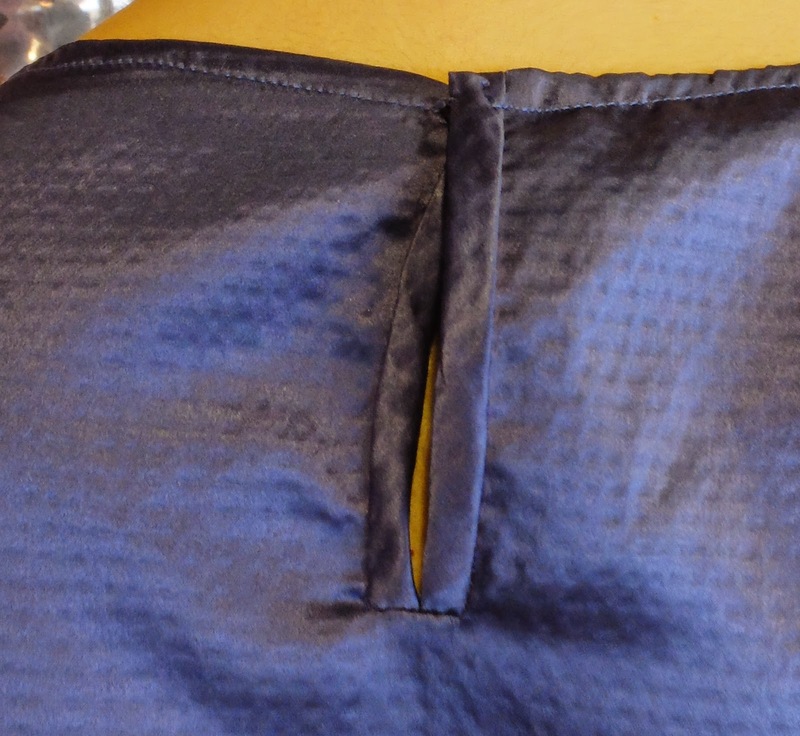 I am not 100% satisfied with my bound slit but I hope to improve with the next garment. At the end, I think that both garments are a very successful addition to my wardrobe. The only inconvenience for me is to cycle in this skirt. Other than that, I receive a lot of compliments for both pieces. And so I say, let’s sew more colourful garments! Beautiful outfit, you have paired them very well. Can't take my eyes of that red skirt!! You look wonderful. Such great colours in Winter lifts people's spirits so you're also helping the community stay positive. Ahhh! The knit skirt is AMAZING!!!! I love that it came in a tube :D And many thanks for the french seam slit finish- I'm about to start on my next Burda tie front blouse and was unhappy with the slit finish. This is a problem solved!! Such a beautiful combination and I have complete fabric envy over that pleated knit! Inna, you bring a smile to my face! You look so wonderful in these bright colours. I love the pleated knit. Don't worry about the seam at the front of the blouse, it makes it more interesting because the light travels different ways on both sides. Yeah I've made three things but I'm not done yet either! THAT RED....holy moly i love it & these colours suit you perfectly. Love the Marant fabric - that red is so vibrant - simply gorgeous and works so well with the color of the top. On the top the center seam coupled with the different cutting direction of the two halves makes it almost look like color blocking. btw you look wonderful in this outfit! This fabric is incredible! I'd like to experiment more with it! I love this post! Beautiful outfit! My daughter picked up some fabric that is just like your skirt and has been wondering what to do with it for about a year now. I can't wait to share your post with her!!! Such a modern use of that fabric! LOVE! You always look so cool! What a fun combo! I love this! You always manage to look classy and fun at the same time. Red is the best, right? To me it's like a new black. I think it goes with everything and looks good on anyone. If the fabric is crazy, do something simple with it! "it goes with everything" - that's what I told myself when I bought the yellow shoes a few years ago and it was true! *^o^* But it's also true with red, it's a bright and happy colour, and it makes a statement, you won't go unnoticed wearing red. Oh, I've never seen knit fabric in tubes in Okadaya :S I need to go back and check! I agree about yellow too! I am mad for the skirt. It is wonderful.